A Strathbogie Forest Greater Glider – threatened by fire and logging. In reply to Vicforests comments reported in last week’s Euroa Gazette article. The community welcomed this position and saw it as providing some breathing space to consider management options for the forest and Greater Glider protection. The Greater Glider is Australia’s largest gliding possum and has recently been listed as vulnerable to extinction by both the Australian Government (link) and Victorian Government (link). So, it came as a total shock when, last week, Vicforests announced it does have plans for more logging – this year! We know that Government agencies and corporations, like Vicforests and DELWP, choose their words very carefully, particularly when briefing a Minister. If, as Vicforests now insists, it has always had plans to continue logging in the Strathbogies, then the advice provided to DELWP clearly had the effect of misleading not just the community, but also DELWP and the Environment Minister! 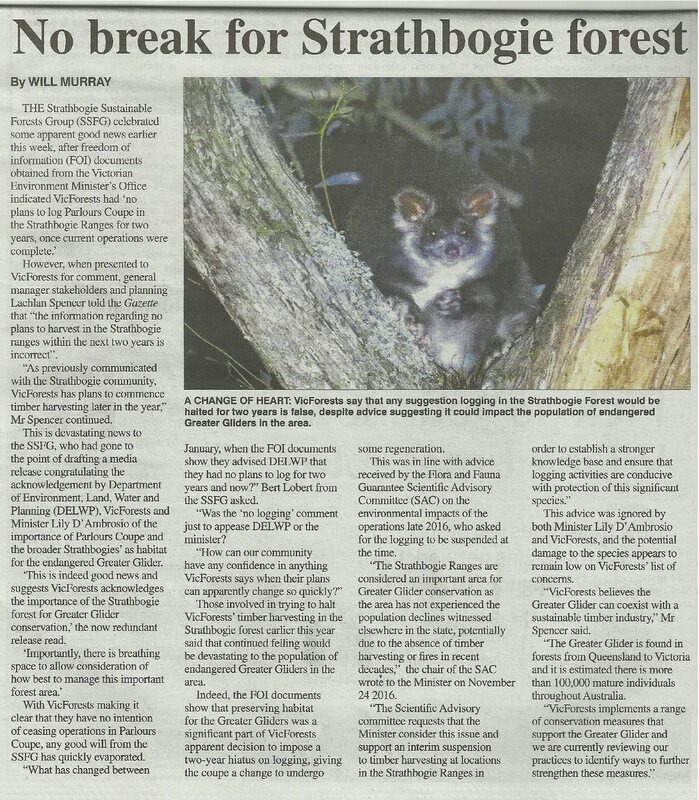 As the FOI documents show, the Environment Minister’s own Scientific Advisory Committee (SAC), along with Government wildlife experts, regard the Strathbogie Forest as a Greater Glider hot-spot. The SAC even took the extraordinary step of writing to the Environment Minister requesting that logging in the Strathbogies be suspended (FOI docs). Vicforests provided their ‘no logging for two years’ advice to DELWP and to Minister D’Ambrosio at the time that their logging of Parlour’s coupe was under scrutiny. Given the heightened profile of Greater Gliders and the expert advice that logging is a direct threat to the species’ survival, perhaps Vicforests were keen to deflect attention from their Strathbogie operations. Who knows, but it’s certainly suspicious. Then there’s the matter of Vicforests claiming it notified the community of its intention to log more forest this year – false. The community has had no correspondence or notification from Vicforests about any logging plans since Parlour’s coupe was logged. The one email that was received, re fencing of the Barjarg coupe (10.3.17), made no mention at all of logging. The Strathbogie Sustainable Forest Group has consistently said it is not totally opposed to logging, but any logging must be demonstrably evidence-based and not compromise the forests’ documented high conservation values. To this end the SSFG has consistently argued for a VEAC Investigation as a way of assessing all the forest’s values and to make informed, balance land-use decisions. In preparation for logging Parlour’s coupe, Vicforests did not conduct any site surveys for Greater Gliders or other vulnerable fauna, not one! Vicforests staff didn’t even visit the coupe at night when these animals are active. Vicforests-managed operations in the Strathbogies now have near zero credibility in the eyes of the community. Prior to the logging of Parlour’s coupe, the community conducted nocturnal surveys and reported high densities of Greater Gliders in and around Parlour’s coupe to both DELWP and Vicforests. This information was completely ignored. Not a single change was made to reduce the potential impact on Greater Gliders – so much for Vicforests implementing “.. a range of conservation measures that support the Greater Glider“. It would seem Vicforests’ words are merely a means to an end. Though perhaps we should have known better, after all, this isn’t the first time Vicforests has misled this community. In the professional opinion of Victoria’s top wildlife experts, ‘the Strathbgie Ranges are a Greater Glider hot-spot’ (FOI docs). Here, below, is an example and a reminder of how Vicforests manages high quality Greater Glider habitat. This is VicForest’s low-intensity, single tree selection at Parlour’s coupe. This entry was posted in Community, Forest Issues and tagged DELWP, greater glider, minister D'Ambrosio, Strathbogie Forest, strathbogie ranges, VicForests. Bookmark the permalink.